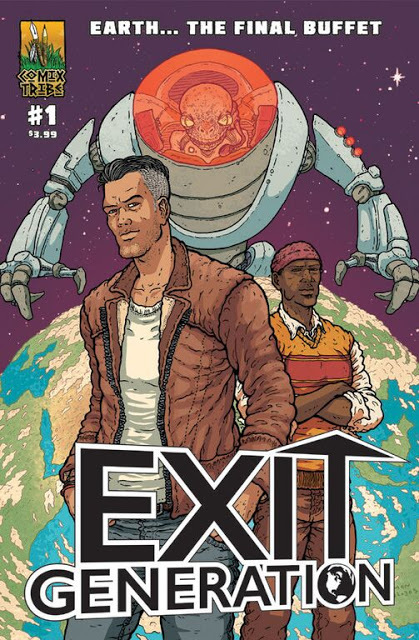 'Exit Generation' #1 is a promising new sci-fi miniseries from Sam Read and Caio Oliveira. Jack fills his time daydreaming and watching 80's action movies and listening to punk rock. It's forty years into the future and 95% of the population have escaped a desolate earth to live in space. Surprisingly, those left behind find peace and prosper anyway. That is until some uninvited visitors threaten to turn Jack's life upside down. 'Exit Generation' actually was released some time ago but thanks to Comix Tribe this is its wide release to the direct market, making it available to stores and on Comixology. The opening prologue is smoothly and concisely constructed by Sam Read. The world building is immediate and clear. The earth has become uninhabitable and space arks were constructed to take most of humanity into space for safety. A couple is separated leaving the unknowingly expectant mother behind. Jack is born and twenty years later his mom is gone and living with his foster family. The tone changes and daily life in the depopulated earth is portrayed in a much more prosperous and bright way than most futuristic world event tales. If it weren't for Read's deft handling of dialogue and exposition the changes that take place would seem more jarring. Instead, Read switches gears seamlessly even with the alien invasion that alters the scope of the book yet again. This isn't the first limited series this year with the "escape a dying earth via space arks" premise. The other comic started with a strong first issue then fizzled out with an uninspired ending. Luckily, 'Exit Generation' has a lot more ideas to play with and hopefully will stay expand on them over the next three issues. Caio Oliveira does solid work with establishing great layouts and character designs. Ruth Redmond's colors infuse the panels with such energy and vibrancy that you've never seen a post-apocalyptic comic this bright. 'Exit Generation' is off to a great start with intriguing characters, an explosive cliffhanger, and fantastic storytelling potential. It's worth adding to your pull list to see what happens next.